Up to this point in our profile series, we’ve mainly focused on the craft of bartending, a profession that’s finally getting its due. We’ve also talked to a few beverage program and bar managers, the people who design menus and run operations. But what about doing all that and more? What does it take to own your own bar? I’ve always been fascinated with the idea of owning a pub, and I’m sure I’m not alone in that idea. To get behind the dream to the reality, I sat down with Andy Duffy on a Saturday afternoon while hockey fans cheered in the background. As I spoke with him about Duffy’s, the Irish tavern that bears his name on Vermont Avenue near the 9:30 Club, it struck me that its one of those “third places” in my life. I’ve had friends work there, close friends are regulars, and hardly a week goes by without someone saying, “I’m heading to Duffy’s tonight.” There have been hockey game viewings, dart league matches, birthday parties and New Year’s. Duffy’s is my neighborhood pub. Andy Duffy is most definitely the reason why we keep returning. But like the best publicans, he shies away from self-aggrandizement. There isn’t even a picture of him in this profile, at his request, because he believes the bar should be front and center. For him, the primary motivation to have his own place is the people factor. His low key pub is the “living room” for this intersection that used to be marked only by being a rough and tumble wasteland, now occupied by condos, the nearby Howard Plaza Towers, and newer bars like American Ice Company. 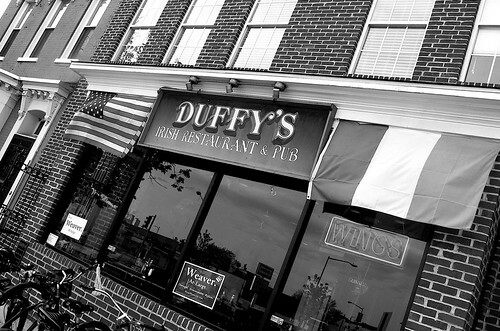 More development is coming soon, but it’s still a bit rough in a different sense – Duffy’s has restrictions on its hours and is unable to stay open after midnight on weekdays, meaning when concerts let out he loses those potential customers. That’s a financial impediment to a pub’s success, and hopefully the results of a recent hearing will help change that in the future. He took a serious risk opening his own bar. The five year anniversary is May 11. I wanted to know, has it been worth it? “I’ve been busing tables since I was eleven years old,” Duffy told me, “It’s always been in the back of my mind to open a restaurant or a bar.” As the general manager of the old Four Provinces (otherwise called the 4 P’s, now known as the Four Fields) up in Cleveland Park, he thought after ten years there he knew exactly what to expect about owning his own pub. He thought he knew exactly how hard and stressful it would be, how big of a time commitment to expect. “Well, I was wrong,” he laughed. 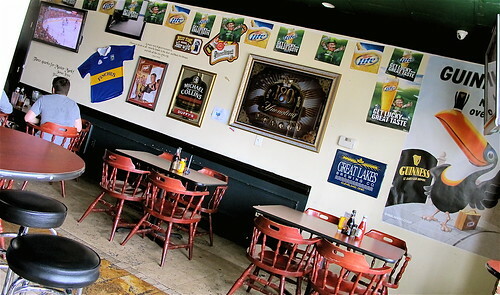 Duffy’s serves food with a tavern license, and before I spoke to him I just assumed the food was an adjunct to the bar in order to meet licensing requirements, as I’m always hearing how difficult that process can be. So I was surprised to learn that wasn’t the reason at all. “I’ve always had my hands in the kitchen,” Duffy said, “I’m no chef by any means, but I’ve learned a lot over the years and I like doing it.” You’ll find the usual Irish pub grub here like fish and chips (my personal favorite) and shepherd’s pie, but also fun items like tater tots, fried pickles and sliders.”Lot of regulars, people who come to shows – we do a lot of food,” he said. The favorite drinks at Duffy’s? 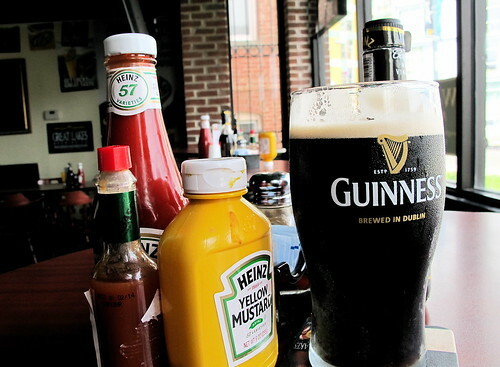 As you might expect, Guinness is the number one seller, followed by PBR and Natty Boh. The crowd favorite for Irish whiskey? Tullamore Dew, at $5 all night every night. Duffy decided to feature Tullamore as something different from the usual pours of Jameson and he said it’s really caught on. Every time I come here, I am struck by the instant camaraderie that Duffy encourages. It’s the kind of bar that you can come to alone, sit at the bar, and within minutes Duffy will have introduced you to a new person. He remembers names and backgrounds, ably matching people up in conversation just as the perfect host should, with a genuine interest in taking care of his patrons. 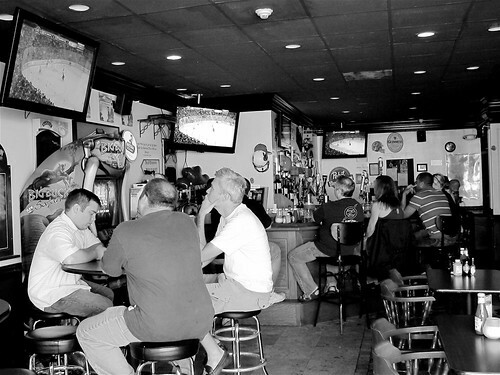 For those who worry about what effect more pubs and restaurants have on a neighborhood, Duffy notes that in the U Street Corridor the owners are responsible, keeping in touch with each other about potential issues and watching out for their patrons. “The more the merrier,” he said, and I agree. When nightlife development is marked by a strong commitment to safety and community, it’s a win for all. The afternoon I came in to chat, Duffy had the Caps game on and a crew of regulars were cheering, including a newscaster and a cop. It’s that kind of place. A city needs taverns like this to stay vibrant and healthy (and who’s to say a shot of Tullamore Dew isn’t healthy!). Where you can pop in for dinner or a pre-show drink, roll over for a nightcap, sit solo and be fine with it, or strike up a conversation with some new folks. In a city where we’ve been starved for so long, where every new place is hailed as the freaking Second Coming of Foodies, it’s refreshing to know that the good old-fashioned pub is still a well-loved part of the neighborhood. And Duffy? I think he’s a truly well-loved publican, and deservedly so. duffys regular. good food. great people.